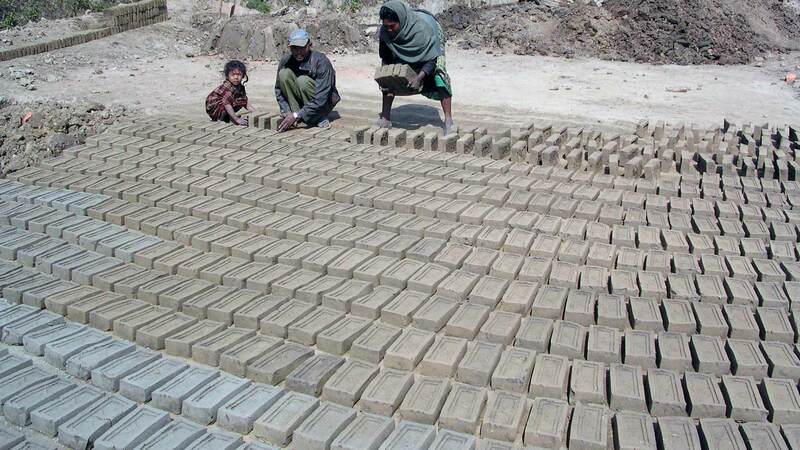 Brick production is a very large and very traditional industry in many parts of Asia. It is a booming industry as the demand for bricks is increasing almost universally due to fast economic growth, urbanisation and prosperity. Every Asian citizen consumes statistically some 250 bricks per year, though the usage patterns vary: while consumption is higher in fast-developing urban areas, there is also a strong trend towards using bricks for improving rural houses: the most common dream of poor people is to replace their thatch houses with solid building materials, and as they may not have the money to build their house in one go, they are doing it ‘brick by brick’. In Bangladesh and the river plains of North India, where no stones are found, large amounts of bricks are used to make gravel for the substructure of roads or as an aggregate in concrete. Over 1,000 billion bricks are produced and consumed in Asia per year, an almost unimaginable figure,. It is the equivalent size of 100,000 New York Empire State Buildings, and the corresponding surface area would be 10 times the present area of Manhattan. This unbelievable amount of built-up area is being created in Asia year on year.